My paintings are painted with a gestural technique; throwing, splattering and dripping numerous layers of acrylic house and art paint onto prone canvas using brushes and sticks. I don’t lay out my paintings ahead of time, nor do I ever use a brush to apply paint directly onto the canvas. I may have an idea of the subject matter, but even that can change while I am throwing. The painting’s subject matter varies from land, sky and waterscape to flora and nests. The technique is abstract, the style, impressionism. Many of my works are over eight feet. By virtue of size and technique the viewer is led into the tangled threads and splatters of paint to discover the substance and feel of the subject matter, the essence of the painted, formed amidst the perceived chaos of drips and splashes. 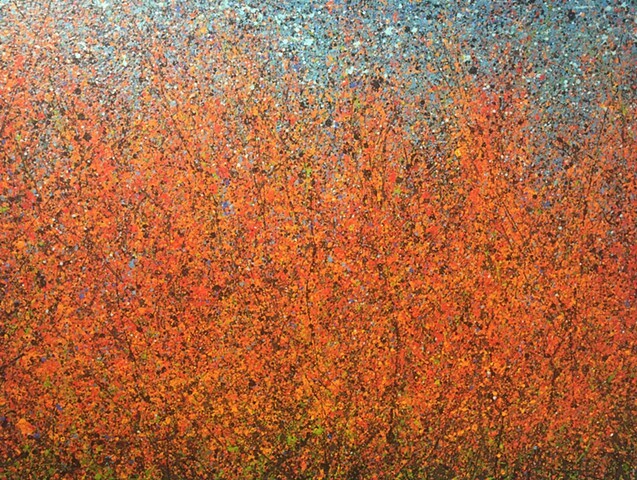 It’s a performance art visualized with impasto effect, one whose outcome is recognized as being rendered with intent, without an intention rendering technique. There is an element of unpredictability, due to the technique, which allows for the perceived chaos to coalesce into the essence of an image. 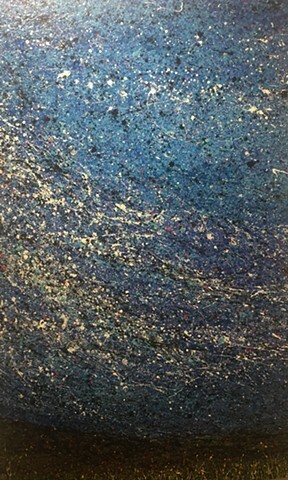 Carey is a mature female artist, taking on the physically demanding work of the male dominated, abstract expressionist, gestural technique of throwing and splattering paint that was introduced in the early mid 20th century. 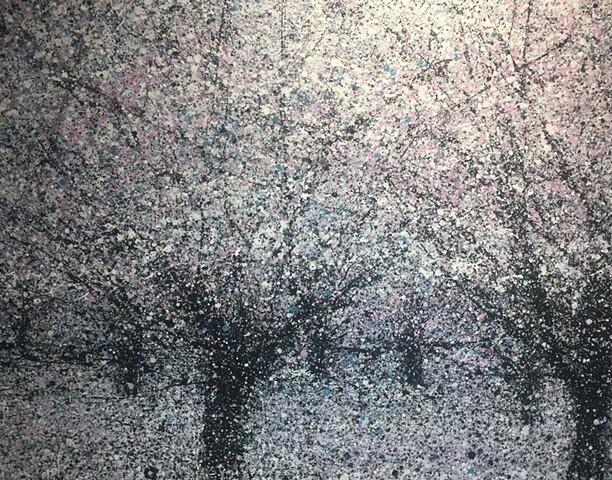 Though the technique is similar, her work is not derivative of Pollock, rather she’s taking the Pollock technique and reversing it a century to create landscapes expressed in an impressionist style. During the first ten years of her professional career, Carey, started a company selling and exhibiting her stone works. She taught workshops in an art therapy atmosphere, lectured in the college and university settings, and had a few of herpoems published. In 2010 she received a grant to teach expressive arts to sheltered youth, since that time she has received two more grants and continues to teach expressive arts to at risk youth and young adults. From 2010 to 2016,Carey, was the curator of a small non-profit gallery, which gave the local community access to art, and artists in the community solo and group exhibit experience. In 2013, Carey went back to school, receiving a Bachelor of Arts degree, with distinction, in Art History from SDSU. 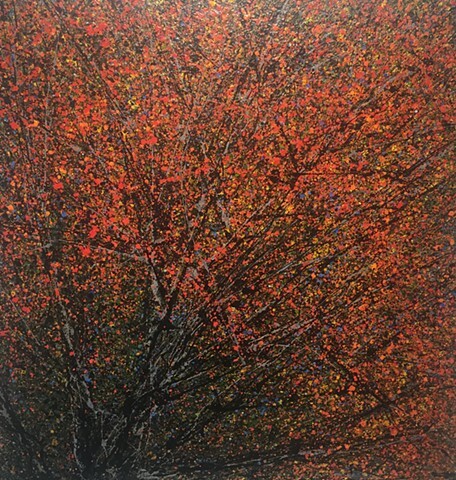 Carey has had numerous solo gallery exhibits, among them, a solo exhibit of ‘thrown’ landscape and flora at, The Japanese Friendship Garden on San Diego’s museum row. Carey has also exhibited in prestigious group exhibits, including those in academic and museum institutions. These include but are not limited to, Abbey de Neumunster in Luxembourg, New York Arts Club, The Historical Society of Washington DC and the Oceanside Museum of Art. Her work was also used in a session, Insight Labs held, with the National Holocaust Museum. Carey has earned numerous awards for her art, among them an award from, Dr. Allen Roberts, professor of World Arts, UCLA, and expert in museum arts. Herwork has been included in a number of publications, from papers and magazines to art periodicals. Carey’s work is held in private, public and corporate collections nationally and abroad.